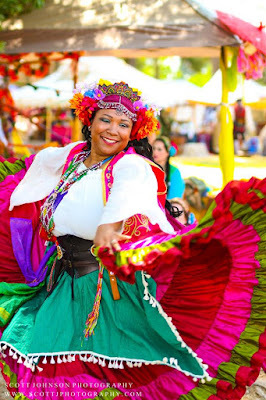 On Being a Renaissance Faire Performer + $150 Gift Card GIVEAWAY!! NOTE: The term "gypsy" in my post and at my faire is no way intended to offend. 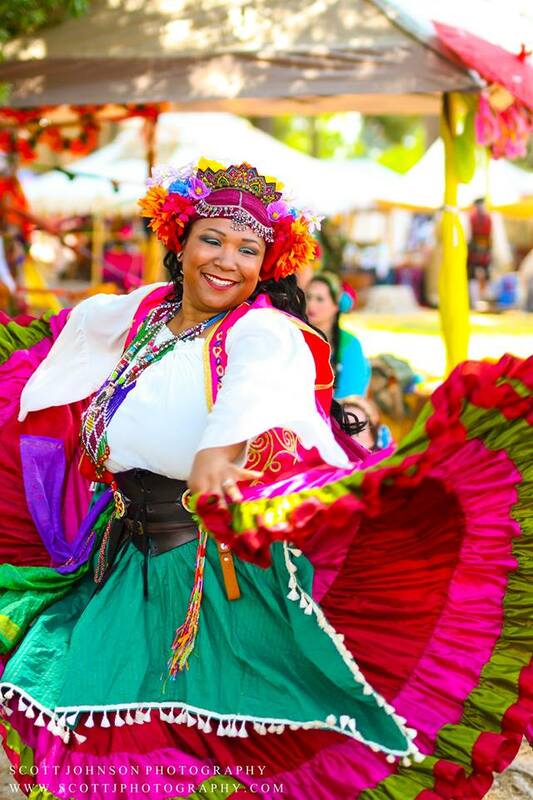 At the faire we dress in a fantasy hodgepodge of gypsy styles from all over the world and we try our best to portray gypsies in a respectful manner. 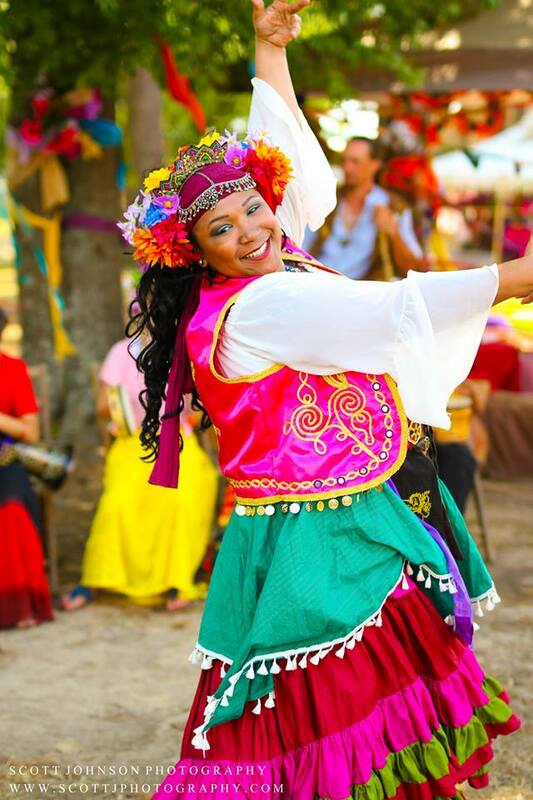 We DO NOT adhere to harmful stereotypes and we aim to celebrate the wonderful Romani people with grace, music and dance. Last weekend, I had the pleasure of being a performer at the 6th Annual Texarkana Renaissance Faire again! Just making sure that you're caught up on all that: I created the Texarkana Renaissance Faire six years ago. Two years ago I realized that I couldn't keep up with the fair anymore. I had just created an online business, I had a blog, a home to manage and two small children. Something had to go! I gave the faire to a friend and faire supporter and who now co-owns it and directs it with another person. The two of them are doing a very good job of continuing the faire for me. Now that I am no longer the owner and director of the fair I am able to do what I've always wanted to do, and that's perform and entertain. At the faire, I play a character named Daniella Noir the Gypsy Queen and I am the leader of the gypsy cast members of the faire. As the leader of the Gypsy Camp, my duties includes rounding up dancers and musicians to play gypsies at the faire, decorating the area, coordinating dances and much more. The camp consists of many different groups. First there's our musicians, most of whom also play pirates. They come over to visit us from the Pirate's Cove and provide us with live music. When they're not there, we dance and drum along to a hidden stereo or "fairy box" as they're called in the ren faire community. A have some members of an American Tribal Style Belly Dance troupe from Dallas (Wild Sky Tribal) come down and they have their own dances already choreographed and they also do "follow the leader" style improvisational dances that are absolutely stunning. We have a small crew from Shreveport, LA come down as well; mother and daughter classic belly dancers and a very talented drummer from the the group Gems of Cairo. The others are local dancers and friends who help me by setting up, drumming, dancing, interacting with patrons and more! Sometimes I dance solo while musicians play and when I get to tired or hot, I trade places with a dancer that is waiting nearby. This year, I tried something new. We did a couple of group dances which are Jewish circle dances, or horas, that we learned on our own from online videos and came together to perform them with very little practice time beforehand! That's us doing the dance in the pic below. When I'm not dancing I play various percussion instruments including, a darbuka , doumbek , aslatua (gourd shakers), zills and a tambourine . I like to challenge myself to see how many instruments I can play at once since sometimes we're a little shorthanded on musicians. While sitting, I place a drum under my left arm and keep a simple rhythm with my left hand while playing my shakers with my right. I place a cheap tambourine on the ground and tap it with my foot or use a foot tambourine . It's a great workout! My favorite part of heading the gypsy camp is decorating. I get to transform a completely blank area into a vibrant space for the patrons to enjoy. It can be quite difficult to transform a modern fairground into a renaissance themed village, but to me it's quite a fun challenge. I like to decorate my area with bright colors and multiple patterns and textures, especially ethnic textiles. I request that my other gypsies dress in the boldest, brightest colors they can find and they do a darn good job of it don't they! I decorate the camp with solid colored scarves, scrap fabric and ribbons but my favorite type of material to use is sari fabric from India. I can use the whole length of an old sari to cover modern items that need to be concealed from public view like ice chests and plastic storage bins. I can drape them over the square bales of hay we use as seating to make them more attractive, and also as table cloths and chair covers. The different materials, patterns and colors that saris come in make it so easy to add life to my gypsy camp. Fabricadabra's amazing sari scrap garlands helped to transform this drab modern pop-up canopy into a luxurious rest area for me and my other dancers. Each garland is a generous 7-feet long, the tassels are 9-inches and they are skillfully handmade in India. As you can see I use many different items from all over the world to decorate my camp. The character I play travels the world and has picked up a souvenir from everywhere she's been. Even though I order all of my clothing and decor online, it is true that it comes from all over the globe! The maang tika , (jewelry over headscarf), silver necklace and skirt were made in India. My pink vest is from Turkey, the large glass bead necklace and beaded belt are from Afghanistan . The green overskirt, brown leather tankard strap and black leather cincher belt were handmade by local artisans. The bracelets attached to my belt that I give to patrons for free were handmade in Peru and my parasol (which is also from Fabricadabra!) was made in Rajasthan , India! 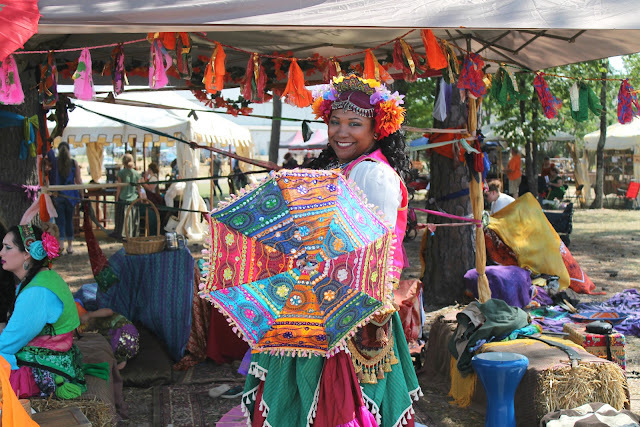 Since sunglasses aren't very period appropriate and the sun can heat up all those layers of garb in a heartbeat, parasols are absolutely necessary for faire characters. Now, the cool thing about this particular parasol, is that it adds SO much more color to my costuming and it can also be used as home decor! When I finally get all the faire decor stuff tucked back where it belongs, I will totally display my parasol and upcycled sari garland in my living room until it's time to use them again for next year's faire! Fabricadabra would like to give YOU a $150 gift card to spend in their shop! Not only does Fabricadabra have amazing parasols and garlands, they have gorgeous ethnic textile throw pillows, bed covering, place mats, floor cushions and more! This shop is a bohemian DREAM! See the gizmo below to enter to win! Thanks for the heads up! Got it fixed now! Your dance outfit looks so beautiful. I would spend the whole faire watching the dancing. Darn, can't enter the giveaway - I've chosen to not be on facebook for drama/bullcrap avoidance reasons. I love Renaissance festivals and I have always wanted to play a character at our yearly Festival since I was younger. You look absolutely beautiful as does everyone else. It's so colorful and I can only imagine how beautiful everything looks when you dance. Thank you for the glimpse and look at what you do. Raine. Hollie, I think you're FAHHHBULOUS! I just adore all these joyful, magical colors. I love them so much that I I'm in the process of painting my kitchen with them! Each wall is a different color, but my favorite part will be the sari fabric strip valances. I'm so excited, and want to thank you for being the epitome of Bohemian inspiration!